According to the back cover, this is not a new book, having been written initially in 500 years BC. Axiom Publishing claim the copyright for this new edition (ISBN 1-84013-512-3), which was printed this year, though the initial English translation was apparently published in 1905. As part of its credits, the book was supposedly used by Napoleon to conquer Europe, having been brought to Europe from China by the French in the first place. However, the book is not being promoted as the best Xmas present you could ever send to George W. Bush, but as a manual for success in every competitive situation, whether it be war, work or politics. A big ask! The book begins with a 40 odd page introduction, with a cast of extras that reads like the Beijing phone book, with an assortment of names to be assimilated such as Ho Lu, the king of Wu, Tzu-hsu (aka Wu Yuan), Sun Wu and Tzu-Chang. Sun Tzu, it is revealed in this introduction, came to prominence by executing two of Ho Lu’s favourite concubines because they had not executed an “About Turn” order properly during drill. Life was obviously tougher in Sun Tzu’s army! The 13 chapters which follow are all short and have numbered concepts for you to follow. These cover laying plans, waging war, attack by stratagem, all the way through to the attack by fire and the use of spies. Probably the most salient point came with “If (our army is) quite unequal in every way, we can flee from him.” This is probably the origin of legging it, now an art form in Thailand after road accidents. 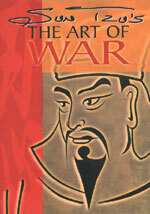 The review copy of the Art of War was supplied by Bookazine and is available from their outlets and other major bookstores. It has an RRP of 450 baht. For a student of ancient Chinese history this is probably a cracking book. For someone whose entire knowledge of ancient Chinese history revolves around the fact that Chicken chow mein originated in America and not in the land of the Mandarins, I found this book a cracking bore. When applied to ancient battles, perhaps such as the Ghobi Desert Storm, then Sun Tzu might have been right on the ball; however, I have my doubts that Stormin’ Norman Schwarzkopf would have used this as his battle manual in the early 1990’s. Most of the book I found incomprehensible and if you harbour doubts, try this, “The e SSU K’ U CH’ UAN SHU (ch. 99, f. 1) remarks that the oldest three treatises on war, SUN TZU, WU TZU and SSU-MA FA, are, generally speaking, only concerned with things strictly military - the art of producing, collecting, training and drilling troops and the correct theory with regard to measures of expediency, laying plans, transport of goods and the handling of soldiers - in strong contrast to later works, in which the science of war is usually blended with metaphysics, divination and magical arts in general.” Sorry, you’ve lost me, Sun Tzu. You lost Napoleon too, otherwise he wouldn’t have ended up on the isle of Elba! Naomi Watts plays Rachel Keller, a reporter for the Seattle Post-Intelligencer who follows the trail of her niece’s mysterious death. Her son Aidan (David Dorfman) tells her that his cousin told him that she would die. Investigating further, she learns that her niece and some friends found the video in a wood side cabin, and that they all died exactly one week after watching it. The cabin itself holds nothing out of the ordinary but the caretaker did find blank videotape, which he assumed the departed teenagers left behind. This movie is a remake of the Japanese cult classic “Ringu.” Gore Verbinski has managed to create exactly the right atmospheric mood with the music and surreal quality of the film; the storyline of the movie makes little impression in comparison. A spooky supernatural film lacking the usual blood and gore in horror films today. Bit of a strange one this, catching Ian Hunter in a bit of a flux in his career. Having just completed touring the highly successful “Ian Hunter” album (Ian’s first solo work) all over Europe and America, and having the hit single “Once Bitten Twice Shy” reaching the upper reaches of the singles charts, Ian Hunter’s side kick for the previous eighteen months, that Rock ‘n’ Roll Gypsy Mick Ronson, decided to take his guitar and production talent off and join Bob Dylan’s Rolling Thunder tour (Ronson’s work on that tour can be heard on the fabulous “Hard Rain” album), so Ian disbanded the band and moved lock stock and smoking barrel to America, where he still lives today. Hence the title to this his second solo work. The completed album was built thematically around Hunter’s move. Recorded over three weeks, several of the tracks were first or second takes, all the material was written, arranged and produced by the man himself. Unusually most of the lyrics were written in the third person, and it appeared that the move Stateside had made him look towards Bob Dylan, Randy Newman, and possibly another English Exile John Lennon for some of his inspiration. Hunter had also become infatuated, it seemed, with the mythology of America and the excitement he had discovered there, giving the album new creativity and maturity. He certainly didn’t play safe with the subject matter of this discerning and at times somewhat disturbing record, as Hunter tackled subjects as diverse as Britain, America, Young Love, the Mafia, Rapists, Anti-drugs, Political corruption, Rock ‘n’ Roll life styles, and God. All head on. Lyrically this is the most mature and potent record in the Hunter Canon, each and every track deserving careful listening. So 5 stars rating for lyrical content, but the slight stumbling block is that although Hunter had assembled a glittering array of session musicians around him to record the tunes they never had the chance to become a band or sound like one, and here lies the problem, all the players turn in a polished performance, but that is exactly how it sounds: very smooth, but also somewhat clinical and sterile. Most Ian Hunter albums sound as if the band are running through a prospective live set, with a beginning, middle, & end, whereas this is just a good set of songs laid down in any old order. Even the only rocker on the album “Restless Youth” (the only track heavy enough on the album you would dare to request in the famous Tahitian Queen’s Rock ‘n’ Roll Happy Hour on Friday) sounds as if everybody is frightened to actually let rip in case they offend someone. Nevertheless the album does have some of Hunter’s classic songs on it. The opening number, “Letter To Brittania From The Union Jack”, a lovely lolloping song that would have been better off as a center piece to the album, was a song Ian addressed to his homeland. Sounding a slightly discordant note of national pride and a plea for England to “Get Its Act Together”. He was at the same time critical of the country of his birth, but also sorrowful of the state the country had got itself into. “Irene Wilde” was a song to a girl from Hunters youth, a poignant fragile ballad of unrequited love, which has remained in his live set to this day. His teenage dream girl rejects him in this autobiographical true story of a “Barker Street Station non affair”, which pushes him on towards ambition and stardom, away from his hometown of Shrewsbry. Hunters previous band Mott the Hoople had done two tours of both the States and U.K with Queen as support so it is nice to hear them adding backing vocals to the hymn like “You Nearly Did Me In”. 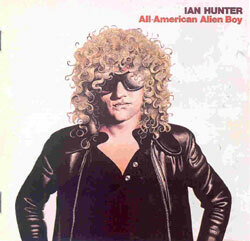 Ian Hunter “All American Alien Boy” was released in June 1976, as Hunter did not tour the album. And since label C.B.S. gave only minimal promotion (no obvious single to promote) the album sunk more or less without trace, although it remains Hunter’s own favorite amongst his solo work. But just around the corner the “Overnight Angels” were gathering.